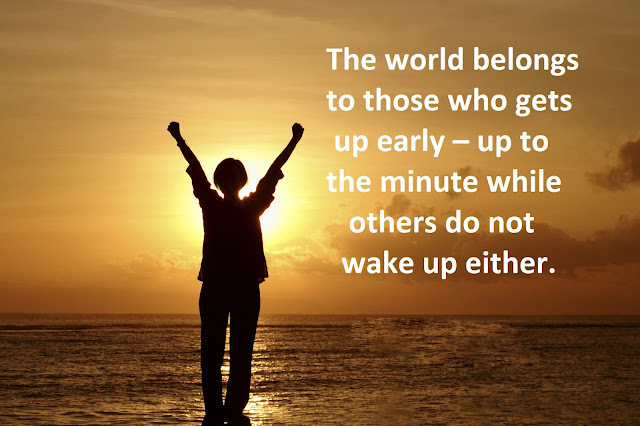 Do you know that most of the successful people in the world get up early every morning? Several studies done globally have correlated being an early bird to success. They have also shown that the ideal time to wake up is 4 AM. The benefits associated with this good habit are both physical and mental. In this article, we are going to discuss the six benefits you’ll receive by waking up earlier. We all have our dreams and goals, and we want to achieve them even if they are difficult. You could desire to own a big mansion or want to achieve a sales target. Your primary goal could be anything. However, the key to reaching your goals in life is to plan how to achieve them. This plan is going to need both subtasks and tasks. It is essential that every day you complete subtasks and to achieve your primary goal. So, by starting your day early in the morning, you have enough time to make your plan. You should rank your subtasks by importance in order to know which you should complete first. Mornings are the ideal time to do your activities and plan how to achieve your goals. A day well planned is very productive and fun. According to studies conducted by Texas University, students who consistently woke up early each day scored better grades and points in their tests in comparison to night owls. When you get up early, you have a fixed routine that helps direct you to achieve your goals. For students, good grades can help increase their quality of life and allow for better career opportunities in the future. Waking up early also provides more time to exercise and eat breakfast, which is an essential aspect of education and better grades achievement. By studying in the morning, a student can retain more information than studying late at night. This concept also applies to anything that people want to accomplish or improve. Breakfast is an important meal of the day. Skipping breakfast is bad for your health because it not only provides energy but also other important nutrients such as calcium, iron. Your body is in fasting mode for six to eight hours during the night, and you need your breakfast in order to break that fast. When you skip breakfast, your body enters the starvation mood. As a result, you can become more eager to eat unhealthy food, or overeat at lunchtime. Having your breakfast at a particular time is a solid basis for eating healthy meals and eating less junk food during the day. Ensure that your meal is large enough and full of well-balanced nutrients that will make you wiser for the rest of the day. Early hours have fewer distractions and that can help you to achieve more than usual. At the beginning of your day, your brain is well charged after a good night of sleep and ready for work. It is the time that you are at your best efficiency, and you have the ability to get things done better and quicker. Early morning is the best time for making decisions, setting and planning goals. In order to have a productive day, you need to get up early so you can have more time to prepare everything. Do you know that people who wake up earlier tend to have better mental health? When you get up early, your mind will be in active mode for the rest of the day. In addition, you’ll feel less stress throughout the rest of your day. According to studies, morning people are more optimistic and confident, and they are more likely to have a happy and satisfactory life. They are less liable to suffer from depression and psychological problems, unlike night owls. So in the long run, if you can keep up this good habit, you will receive more mental health benefits that can lead you to a more positive attitude in your life. Early risers are usually more aggressive than those who wake up later. They have their life, goals, and dreams under control. When you get up early, you have more time for strategic thinking, getting organized, and planning. In addition, it will also help you go to work earlier than your colleagues. In this situation, you can make your plan with fewer distractions from colleagues. It also gives you time to be alone and to be more creative. If you want to lead a healthier, happier life with a more positive attitude, try to get up early every day. It may be difficult for the first few days, but your body will adjust automatically. Day by day, you will discover the benefits of this good habit!